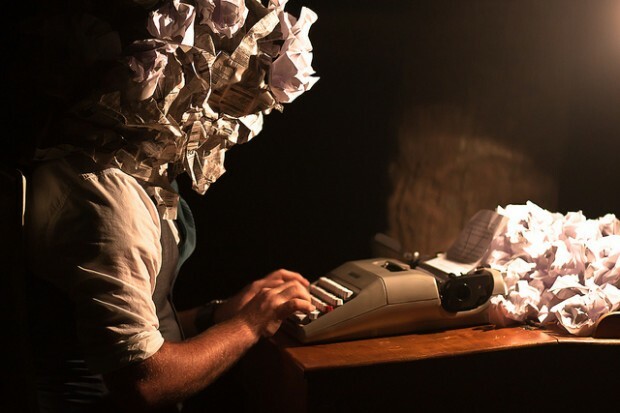 Don’t get social media writer’s block. Look in these 3 places for inspiration. Image by Drew Coffman. Another day, another Tweet. Or maybe it’s 10 Tweets? Or 25? Maintaining social media accounts involves a lot more than just firing off a message once a day. To attract and keep a following on Twitter, Facebook or Google+, you need to engage with users and share content that is both valuable and interesting. Finding that content can be a challenge. That said, there is a lot out there if you know where to look and how to follow. What can be even more challenging is coming up with the social messaging to support that content. Sure you could use the headline, but so will 95% of the other people who share that blog. Writing a Tweet or Facebook post that will actually catch someone’s eye in a stream of hundreds, even thousands of other posts is a real test. To help you stay fresh and set yourself apart on social media, here are 3 sources of inspiration you might want to turn to when writing Tweets or Facebook Posts. If you’re sharing a blog post or article with your followers, look within the text for quotes. The words within those two quotation marks might be your best bet for a powerful social media post. When an author chooses to include a quote, hopefully it’s because that expert or source adds real value with their words. If an interview took place, the writer may have chosen that single quote from an hour discussion, a testament to its importance. Frequently, the quoted expert has also honed their messaging through many interviews and talks. What is powerful in a speech can be equally powerful in a Tweet. Often times sources are included simply based on their reputation. In that case, quoting someone who is recognizable to your following will increase the likelihood of a Tweet or post being shared. Plus, attributing the quote to that person by mentioning their Twitter handle could result in a high-profile retweet from the source, further expanding your reach. Quotes are a great way to connect to your followers on a more human, less technical level. This is especially true if the quote evokes positive emotions like inspiration or laughter. This isn’t a groundbreaking revelation for most of you, but pop culture reference can significantly increase your chances of getting clicks and shares on Twitter and Facebook. Quoting Ice Ice Baby seems nonsensical, especially for an Enterprise social relationship platform, right? Well that Tweet performed far, far better than any serious or straightforward Tweet we shared. Part of this is newsjacking. Mentioning a show that people are obsessed with at the moment (Game of Thrones anyone?) or a current event (a la Oreo Superbowl Tweet) is a great way to capitalize on people’s interests right here and now. But pop culture references don’t need to be modern. In general, people are more likely to share something that resonates with a larger portion of their own following than something very segmented. Put simply, more people like television and music than the latest trend among chief information officers in North American tech companies. We’re not saying don’t write that technical piece, we’re just saying don’t be afraid to ditch the formal, corporate line and spice up your social messaging using some relatable references. Create a stream to see what followers are saying about the content you share. Believe it or not, you might be a little biased about your own content. After writing a blog post, you will likely have a specific idea about what is the most important part of it. That part will likely become the focus of your social messaging. But, and this is important, your followers might leave that content with a different impression. The people who read your content without any preconceived notions about it are probably a far better judge of what within that content stands out. 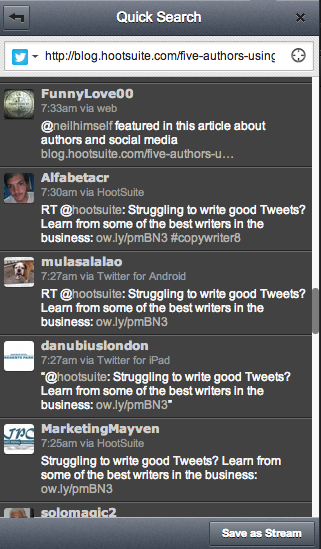 All of this to say that your own followers might be writing much better Tweets about your content than you do. Follow your own content on social media by creating a search stream in HootSuite for the url of your blog or content. This will pull up any Tweet to that piece, allowing you to see what others are saying about it. If any of these messages has received great engagement, learn from their success and use a similar strategy with your own Tweets or posts moving forward. In the case of social media, there are going to be times where your followers inspire you, not the other way around. Did we miss any great sources of social media inspiration? Let us know in the comments or via Tweet.